Picture: REUTERS . 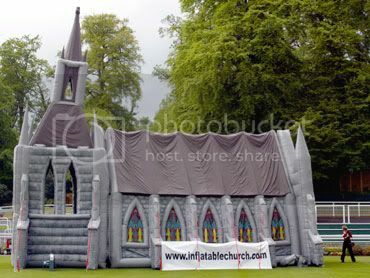 The world's first inflatable church is 47 feet high and has a blow-up organ, a polyvinyl pulpit, an air-filled altar and fake stained glass windows. The world's first inflatable church opened its Gothic arches to worshippers today to reveal a blow-up organ, a polyvinyl pulpit, an air-filled altar and fake stained glass windows. The church is the brainchild of British entrepreneur Michael Gill, who says it could breathe new life into Christianity by letting preachers take their message into their communities. A priest could carry it around on the back of truck and set it up on patches of grass or in village squares for impromptu services, he says. "Churches used to be at the centre of our communities and sadly that's not the case anymore," Gill said as he stood in front of the church during its public unveiling at a Christian exhibition in Esher, just outside London. "This is one way to reverse that trend, make the church more accessible and put it back where it belongs." At STG22,000 ($A54,835), the 14-metre high church will be too costly for many parishes. But Gill says he has had expressions of interest from over 20 countries thanks to his website www.inflatablechurch.com and has even been asked to design inflatable mosques and synagogues.